They say all of the best parties are found on the Strip, but the sbe management group begs to differ. With its newest property, SLS Hotel, sbe is also delivering a new name in Las Vegas nightlife entertainment - LiFE. As the name suggests, LiFE is one definitive venue, delivering on the Las Vegas nightlife staples like none other. Sticking with the modern theme that has taken over Vegas' nightclubs, LiFE delivers VIP seating in the form of sleek black leather benches. Unlike some clubs where these seats are scattered throughout the club, LiFE's design was done with a purpose in mind. Three tiers offer up different elevations of seating, but not one spot is better than he next. The elevated design guarantees that everyone, no matter where they are in the club, has a first-rate view of the action unfolding on the bottom floor, where the dance floor and DJ booth reside. Here, a crew of resident and guest DJs, including the talents of Erick Morillo, will spin a mix of EDM and house music to keep the dance floor crowded. Sitting on the top tier also doesn't mean you're going to be disconnected from the action. 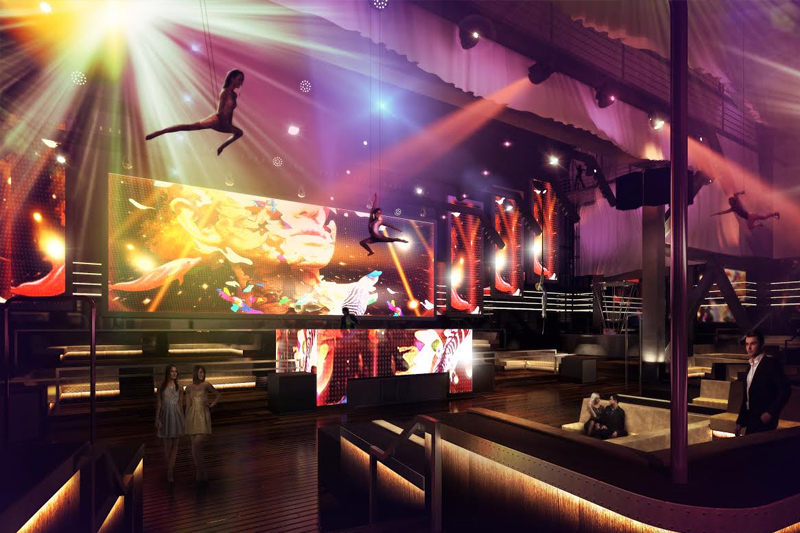 Individual platforms lining the edge of the upper floor will provide a space for some of the club's live performers to lose themselves in the musical stream from the DJ. Though they will garner plenty of your attention, the dance floor and DJ booth may easily be overshadowed by the eye catching light show going on around them. LED boards line the wall behind the booth while an imaginative 3D-mapping display puts technology in the forefront. From overhead, a series of catwalks provide a launching point for live entertainers to take flight above the tables. If you're amongst some of LiFE's lucky patrons, one of these acrobatic daredevils will have a bottle of premium liquor for you when they touch ground. If you stay on LiFE's first story, you're going to be missing out on the outdoor party space Beach LiFE. The size isn't anything too impressive, but it doesn't need to be. This rooftop venue will deliver the same thrills as LiFE with the added benefit of cabana rentals and a refreshing pool to wade in. On opposite ends of the space, a bar and performance area lie, ensuring that the crowd doesn't have to congregate in one space. To make sure you have the best experience at LiFE, you are going to want to spring for the premium bottle service. Avoid the line at the door and get escorted to your VIP table complete with black leather bench seating. Kick back with a bottle of premium liquor that will be delivered personally to you and wait for the eyes to start to fall upon you, wondering just who you are to deserve such special treatment. With free mixers at your behest, feel free to invite a few fellow partiers to your table for an added good time. Call us today at 1-800-VEGASVIP for information on bottle service at SLS' premier nightclub, LiFE.